This Greek myth follows inventor and architect Daedalus, who commits a crime in Athens and is banished to Crete to serve King Minos. Determined to right the wrong of his crime, Daedalus becomes a father to Icarus, a daring and precocious boy whose eyes are on all the glories of the world around him – the sky, the sea, the stars – while Daedalus buries himself in his work, attempting to save the people of Crete from King Minos' shrewd plans, which include sacrificing humans to a ravenous minotaur. Complicating things further, Icarus falls in love with Ariadne, the daughter of Minos. After adventures involving sea god Poseidon, the Labyrinth, the slaying of the minotaur, and a broken heart, Daedalus and Icarus find themselves in a locked tower, surrounded by Minos' ships. Daedalus makes wings made of feathers, wax, and wood – their only hope for escape from the tower. With his eyes on the sky, Icarus soars and hollers with joy. Daedalus watches in horror as his son flies too close to the sun, which melts the wax in his wings. Icarus falls into the sea and perishes. A grieving Daedalus flies on to Athens, honoring his son by keeping his eyes on the beauty of the world around him. Approximately 45-50 minutes. My students inspired this play. I teach theatre arts and direct plays for a high school in Minnesota. We wanted to take a play to our one-act play contest that was unlike anything we had seen at previous years' contests. We wanted a play that used some movement training we'd been working on, incorporated music, and highlighted our ensemble. Icarus was the happy result. My favorite line is "There are still stars." With all the hubbub of our daily lives, I think it's important to remember that life is made up of small things, and that living is made up of recognizing and celebrating those small things. My daughters and I practice this each morning by looking at the sunrise together. They help teach me to stop, breathe, and take in the world. And regardless of where we are at in our lives, those stars still appear each night, and the sun still rises each morning. Q: What was the most difficult part in creating a work based on Greek mythology? 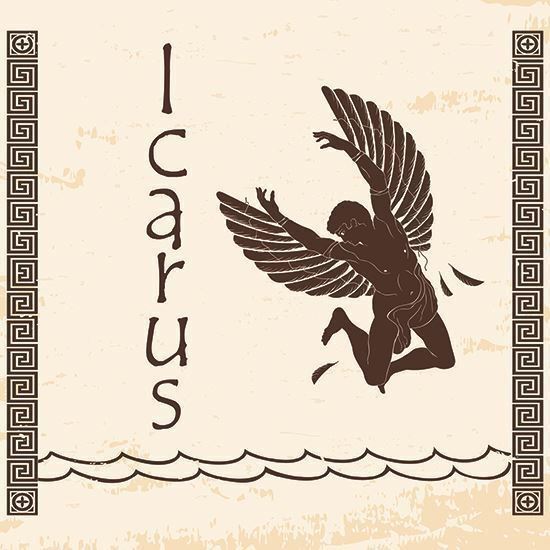 There is a lot of plot in the tale of Icarus! When I started researching the story, I realized this was just as much a story about Daedalus as it was about Icarus, and between his early life in Athens to his relationship with Naucrate to the Minotaur, there is a lot to cover in a one-act play. This is one of the reasons a Storyteller is incorporated in the cast. That character helps divulge plot details and keeps the pace moving. I wanted to tell a story of hope amidst tragedy and love amidst loss.